George Terhanian has left his role of Group Chief Research & Analytics Officer; President, Analytical Solutions at consumer specialist The NPD Group, to 'pursue new interests'. 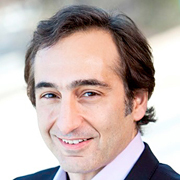 Terhanian (pictured) joined NPD four years ago, having previously worked at online community and survey technology provider Toluna as Chief Strategy & Products Officer and President, North America. Earlier, he spent nearly fourteen years at Harris Interactive in a number of leadership roles including President, Global Solutions; President, Global Internet Research; and President, Europe. He currently serves on the Board of Directors of the Advertising Research Foundation (ARF). Commenting on his departure from NPD, Terhanian told DRNO that he has not yet decided on what he will do next in his career or life. Brian Smith, NPD's EVP, Analytic Solutions, will now lead the group's Analytic Solutions team in North America. He joined the business last year from IPG Mediabrands, where he served as Global COO, Mediabrands Insights, having previously been ThinkVine's COO. Smith began his career at Procter & Gamble, before taking up research and brand strategy roles at Medsite, Interbrand and Nielsen companies BASES and the Cambridge Group.